To see the original puzzle, CLICK HERE. The “Where Wolf?” puzzle is an adapted version of a logic problem from the fantastic book, What is the name of this book? (Yes, that is the title…*), by Raymond Smullyan. I have mentioned this book before, but it is certainly worth another recommendation here. WITNOTB? takes you through the principles of logic problems step by step, rolling its ideas up into a series of entertainingly oddball episodes involving knights and knaves, Alice (she of Wonderland and Looking Glass fame), Tweedle-dum, Tweedle-dee and their lesser-spotted third brother Tweedle-doo, high priests and monkeys, lions and unicorns, all culminating in a life-or-death confrontation with Count Dracula himself (possibly). 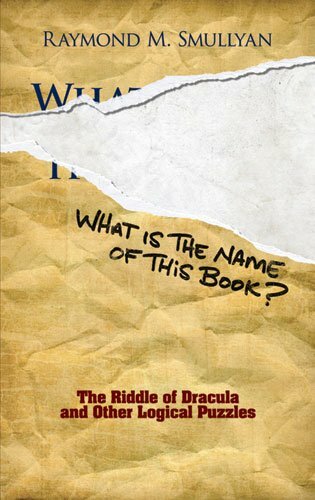 One thing that really keeps you on your toes, is that in this book it is perfectly possible for the correct answer to a problem to be that there is no answer (or, occasionally, that there is no question! ), which means that you have to consider your responses extremely carefully. This werewolf puzzle is number 98, and it stands out for me as the one question that really caught me out when I was reading through the book. The original version involved a slightly different scenario (though also with a werewolf) and was titled “How to choose a Bride on the Island of Bahava”. The big obstacle to overcome in this puzzle is how to deal with the child who sometimes tells the truth and sometimes lies. Since you do not know which child this is, it is impossible to guarantee that you will not direct your question to them, and if you do end up asking this child a question, then the answer that you receive runs the risk of providing you with no information at all. Here is the problem. Your question can only be of value if you intend to act differently based on the answer that you receive (“Yes” or “No”), otherwise there is no point asking a question at all. However, whatever valid question you ask, the child who sometimes lies and sometimes tells the truth could always give either response, apparently rendering the answer worthless. Yes, you could ask a question like “Do you always lie?”, to which only this child could answer “Yes”, but if you receive the answer “No”, then you have still learned nothing. Looking at the puzzle in the context of information theory also seems to suggest that it is impossible. There are three potential werewolves, but a “Yes”/”No” question can never distinguish between more than two alternatives, so your hope of locating the werewolf to ensure that you can make a safe choice appears to be bleak. This was my line of reasoning when I was reading through the book. I decided that there was no solution (which had been the case for other questions). However, I was wrong. The key thing to realise is that you are not trying to reliably identify the werewolf (which is impossible), you are trying to identify someone who is not the werewolf. The problems that I discussed above only arise when you speak to the child who sometimes tells the truth and sometimes lies. However, since this child is the werewolf, as long as your strategy dictates that you never choose the child to whom you ask your question, these problems all become irrelevant. If the girl that you are talking to is the truthful child, she will answer “Yes” if her sister is the werewolf and “No” if her brother is the werewolf. If she is the liar, then she will also answer “Yes” if her sister is the werewolf and “No” if her brother is the werewolf. If she is the child who sometimes tells the truth and sometimes lies, then she may answer “Yes” or “No”, but either way, she is the werewolf and both her brother and sister would be safe guides. In all of these scenarios, you will have enough information to choose a safe guide. Ask the sick girl: “When asked a question, is your sister more likely to answer truthfully than your brother?” If she answers “Yes”, choose her brother as your guide; If she answers “No”, choose her sister. There was quite a good response to this puzzle, so there are a number of answers to sift through. First off, one person came up with pretty much the exact question that I had in mind. Congratulations to Reddit user AcellOfllSpades, whose solution can be found HERE. One interesting idea was: “If I were to ask the werewolf X, what would it reply?” where X is any question to which all the children would know the answer (from A Kynoch, via Facebook). The logic here is that, since only the werewolf can know how it would answer, and since the other children are required to either lie or tell the truth, only the werewolf would actually answer the question at all. While this is ingenious, I do feel that your question should be one that every child can answer, otherwise it is not really a “Yes”/”No” question, but a “Yes”/”No”/”I don’t know” question. Also, there is no guarantee that the werewolf child does actually know how it would answer any particular question before that question is posed. On yes go with C, on no go with B. If werewolf is B, both liar/truth-teller say yes. If werewolf is C, both liar/truth-teller say yes. If werewolf is A, doesn’t matter. If S1 says “Yes”, choose to go with S2. If S1 says “No”, choose to go with B. An interesting puzzle. Initially looks difficult but once you realise that as long as you construct a question that leads you to select anyone other than the one answering, then it doesn’t matter what answer you get if you happen to be questioning the werewolf , then it gets much easier. 1. The sister you ask tells the truth, the brother is a werewolf, so the answer she gives is “Yes”. You pick the other sister. If the brother isn’t a werewolf, she answers “No”, pick the brother. 2. She is a liar and the brother is a werewolf, she will answer “Yes” (lying about both statements combined truthfulness). pick the other sister. If she says “No”, pick the brother. 3. She is the werewolf, gives a random answer, but it doesn’t matter what answer she gives or who you pick. There’s bound to be a more eloquent way to phrase the question than the version I used. Smullyan would phrase Geoff’s question as: “Is the statement ‘You always tell the truth’ equivalent to the statement ‘Your brother is the werewolf’?” The word “equivalent” here refers only to the truth or otherwise of the two statements, querying whether they are either both true or both false. The principle of asking whether two statements are equivalent is a powerful tool that is discussed in great depth in What is the name of this book? Congratulations to all those who conquered this puzzle. I will add some details on the follow-up question soon. Comments are still welcome on this. ** As we have already established, upon your return, you will be immediately contacting the appropriate authorities, so this line of reasoning is in her best interests, as well as yours. Book cover: From the Amazon listing. I figure this is fair use, given that this is more-or-less a review, and a highly positive one at that. 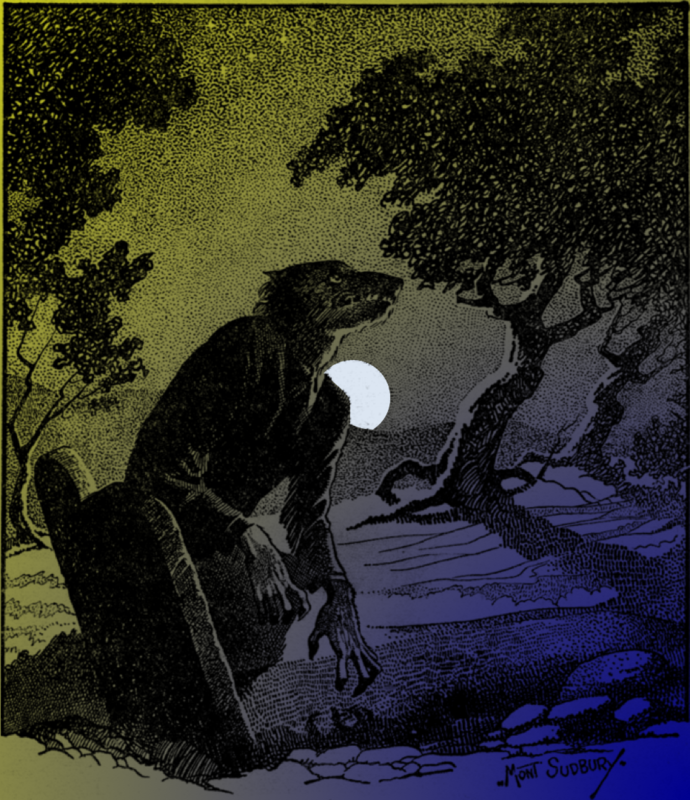 Werewolf: Public Domain – This is an altered version of the accompanying illustration for “The Werewolf Howls”, a story published in Weird Tales (November 1941, vol. 36, no. 2, page 38).